The Junior League of Washington (JLW) is pleased to announce the 60th annual Holiday Shops. 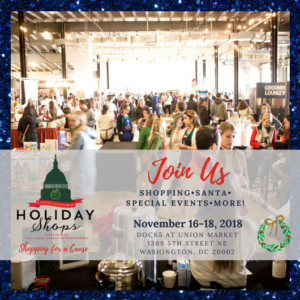 Friday, November 16, 2018: 6 – 11 p.m.
Saturday, November 17, 2018: 10 a.m. – 6 p.m.
Sunday, November 18, 2018: 10 a.m. – 5 p.m.
Holiday Shops is more than a unique shopping experience; it is also one of JLW’s major fundraisers. Funds raised at the event support the League’s ongoing efforts to improve the Washington, DC, community through the effective action and leadership of trained volunteers and by awarding annual grants to local nonprofits. Each year, we welcome thousands of shoppers throughout the weekend. Our merchants will help you find those special gifts for your family and friends, and with each purchase, you will know you are making a positive impact on our community. For more information or with any questions, please contact Co-Chairs Zoe Louise Jackman and Greta Pisarczyk at HolidayShops-Info@jlw.org. The Junior League of Washington strives in all endeavors to be sensitive to the special needs of its members and guests. If you have any special needs pertaining to our event, please let us know.